Haylie has been asked to do a cooking demo at this year’s South Beach Food and Wine Festival in Miami - in front of hundreds of foodies and famous chefs. It’s intimidating, to say the least. With the help of friend, Arielle Kebbel, Haylie tests two recipes for the demo: Green Chicken Enchiladas and Kale and Pea Pesto Linguine with Pancetta and Grilled Shrimp. Armed with a private demo lesson from famed chef, Jet Tila, Haylie is ready to take on Miami! But will she win over this gourmet crowd? 4 oz. Chinese Sausage, sliced thin. Cut the pineapple in half lengthwise and cut out the fruit section. Remove the core and cut the fruit into medium dice.Reserve about one cup of pineapple for the fried rice. In a large skillet, heat oil until a whisp of white smoke appears.Add the dried shrimp and fry until crispy, about 20 seconds. Stir in garlic and shallots and cook until light brown. Add the Chinese sausage and cook until they are slightly crisp, about 2 minutes.Add shrimp and ginger and cook until the shrimp start to turn pink, about 1 minute. Fold in rice; make sure not to break rice grains. Add in the fish sauce, soybean sauce, sugar and curry powder.Continue to stir for about a minute. Stir in Pineapple and incorporate well. Cook the fried rice for about 1 to 2 more minutes, folding constantly and mixing all the ingredients well. 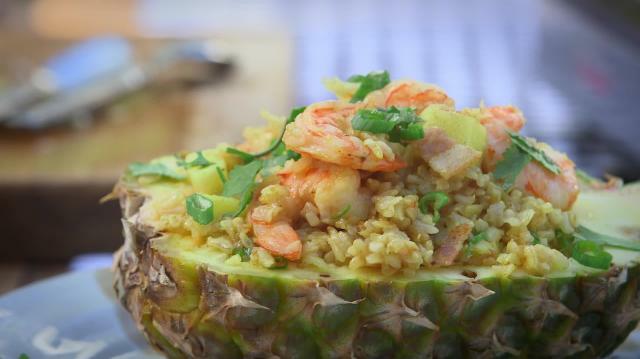 Fold in green onions and white pepper.Transfer the fried rice into the halved pineapple. Garnish with some fresh cilantro. Bring a pot of water to boil. Add box of linguini and a pinch of salt. Cook linguini and strain. Transfer to bowl and toss with a drizzle of olive oil to keep from sticking. Thread shrimp on metal or soaked wooden skewers, running skewer through the body once near the tail and once near the head end of each shrimp. 4-5 shrimp per skewer. Drizzle olive oil on skewered shrimp, and season with sea salt and lemon pepper. Place skewers across a hot cast iron grill pan, and flip, until shrimp are pink. For the pesto, combine kale, basil, parmesan, peas, salt and garlic into a food processor. Pulse. Continue to let the food processor run on slow, and add the extra virgin olive oil. When mixture is fully combined, transfer to a small bowl. Add lemon zest, lemon juice, crushed red pepper and yogurt. Gently Fold. Toss the pesto into the finished linguini. Top with grill shrimp, pancetta and fresh peas. In a large sauce pan, add all ingredients and bring to a boil. Once boiling, reduce to low and keep covered. Cook for 10 to 12 minutes. Pull breast out and let sit. When cool enough to handle slice chicken thinly. Add to bowl. Preheat an oven to 450 degrees. Place tomatillos, jalapenos, lime, garlic, and white onions on a baking sheet. Roast for 15 to 20 mins, until tomatillos pierce easily with a fork.Pour contents into a vitamix and pulse until sauce is liquefied. If too thick, add a ½ cup of water, at a time.Set aside. Reduce oven temperature to 375 degrees. In a 9 x 13 baking dish, Pour 1 cup of sauce on the bottom. On a work surface, take a tortilla fill with poached chicken and roll, like a cigar. Lay in a baking dish. Fill until dish is full. Pour remaining sauce on top of rolled tortillas. Cover with shredded cheeses. Add crumbled queso fresco. Cover with aluminum foil and bake or 15 mins. Remove foil and finish for 5 more minutes.